THE FIRST BOOKE OF MOSES, called Genesis. THE SECOND BOOKE OF Moses, called Exodus. THE THIRD BOOKE OF Moses, called Leviticus. 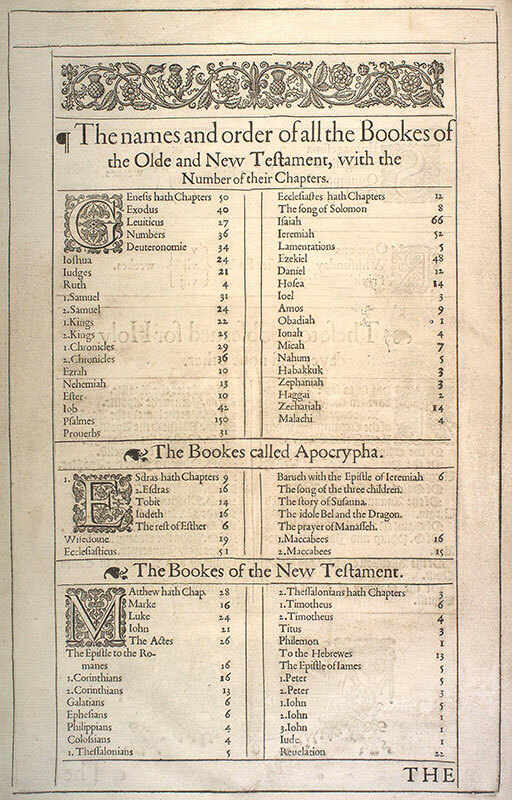 THE FOURTH BOOKE OF Moses, called Numbers. THE FIFTH BOOKE OF Moses, called Deuteronomie. THE FIRST BOOKE of Samuel, otherwise called, The first Booke of the Kings. THE SECOND BOOKE of Samuel, otherwise called, The second Booke of the Kings. THE FIRST BOOKE OF the Kings, commonly called The third Booke of the Kings. THE SECOND BOOKE OF the Kings, commonly called The fourth Booke of the Kings. THE FIRST BOOKE of the Chronicles. THE SECOND BOOKE of the Chronicles. THE BOOKE OF THE Prophet Isaiah. THE BOOKE OF THE Prophet Ieremiah. THE BOOKE OF THE Prophet Ezekiel. The Gospel according to S. Marke. THE ACTES OF the Apostles. THE EPISTLE OF PAVL THE Apostle to the Romanes. THE EPISTLE OF Paul to the Galatians. THE EPISTLE OF PAVL THE Apostle to the Ephesians. THE EPISTLE OF PAVL THE Apostle to the Philippeans. THE EPISTLE OF PAVL THE Apostle to the Colossians. THE FIRST EPISTLE of Paul the Apostle to Timothie. THE SECOND EPISTLE of Paul the Apostle to Timothie. THE EPISTLE OF PAVL the Apostle to the Hebrewes. THE GENERALL Epistle of Iames. THE FIRST EPISTLE generall of Peter. THE SECOND EPISTLE generall of Peter. THE FIRST EPISTLE generall of Iohn. The second Epistle of Iohn. The third Epistle of Iohn. THE GENERALL Epistle of Iude. THE REVELATION of S. Iohn the Diuine. THE WISDOME OF Iesus the sonne of Sirach, Or Ecclesiasticus. The historie of Susanna, set apart from the beginning of Daniel, because it is not in Hebrew, as neither the narration of Bel and the Dragon. The idole Bel and the Dragon. The prayer of Manasses King of Iuda, when he was holden captiue in Babylon. The first booke of the Maccabees. The second booke of the Maccabees.